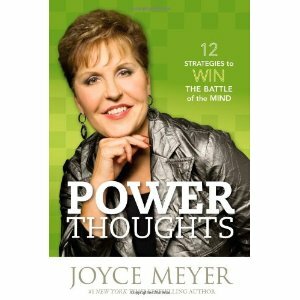 I have never read a Joyce Meyer book before. I went into this book with an open mind and no idea what it was about or who she is. I have spent the last three years focusing on having a positive attitude and trying to maintain a smile in the face of challenges. So having the ability to read this book was a great opportunity for me. This book offers 12 strategies to win the battle of the mind. One of my favorite quotes over the last few years is by Scott Hamilton “The only disability in life is a bad attitude”. I’ve watched my son thrive in the face of disabilities and it’s because he has a great attitude so this quote has had a direct impact on my own outlook on life. While you read this book you also use it as a workbook. There are exercises for the reader to actively participate and mediate on in each of the chapters. There is space for you to write in the book and scriptures to back up the exercises. Joyce offers a way for you to complete the book and gain the most out of it. She wants you to read the book all the way through. Then she wants you to come back and focus on one power thought a week for the next twelve weeks. She then wants to reflect on your experience and continue with the twelve week plan for an entire year. It might seem like a lot of work to commit to for a year and I can’t say if it’s hard or not since I’ve only had the book for about a week. I can tell you that after reading the book all the way through I don’t think it’s as big a challenge as it would seem at first. This is a great book for those looking to change their lives in a positive way. It uses scripture and uplifting quotes as guides to that change. It’s definitely worth it if you are ready for a change. I received a copy of this book to review but was not financially compensated in any way. The opinions expressed are my own. Erin is an Army wife and mom of two girls and one boy who lives in Utah. I love to read, blog, and be an advocate for childhood stroke survivors like her son. i also gave joyce a shot. i watched her shows twice a day and took notes like crazy. i stopped when i heard her misquote scripture.